We realize that going to a new doctor can be a bit intimidating. We want your experience at Total Body Healthcare to be great! Therefore we would like to let you know what to expect on your first visit to the office. Of course we need some information from you about your health. On our forms page you can download all the necessary paperwork that we will need from you. Filling this out before you come in will save you time at the office. After watching a brief video about chiropractic you will meet the doctor. During this time you will be able to discuss your health issues with him. You will also begin to learn ways to improve your health. We take pride in the thoroughness of our examination procedure. Chiropractors have always been known to look for the cause of your problem and not merely examine the symptoms. Your exam will include a complete chiropractic spinal check, a computerized scan of the nervous system, digital range of motion (if necessary) and x-rays of the spine (if necessary). On your second visit you will be given a thorough explanation of the results of your examination. You will spend some time with the doctor as he explains your results and the details of your treatment plan. After all of your questions are answered, you will receive your adjustment to begin the healing process. As you begin your journey towards health, we are here to assist you in several other ways. We offer a full line of custom made shoes and orthotics, ergonomically shaped pillows and supports along with vitamins and supplements. The primary form of care in our office is the chiropractic adjustment. 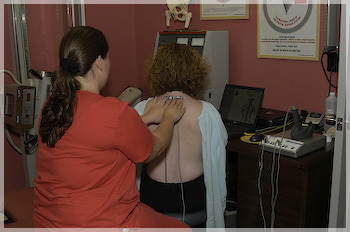 The goal of the adjustment is to restore normal spinal motion to areas of the spine that have lost their normal motion. This loss of motion results in abnormal function of the delicate nerves that exit the spinal cord in between these vertebra. This abnormal function of nerves along with the loss of normal vertebra motion is called the Vertebral Subluxation Complex. The Vertebral Subluxation Complex, or subluxation, can cause a variety of health problems. Since the nervous system is the master controlling system of the body, if it is not functioning properly then your body cannot function properly. Common conditions that our patients have told us that have improved under chiropractic care are headaches, arm and shoulder pain, leg pain, foot or arch pain, low back pain, allergies, digestive complaints, colic, ear infections… the list is actually quite extensive. Through a series of adjustments, your spine will begin moving like it is designed to and normal nerve function will be restored. How do you know if your nerves are functioning correctly? Better yet, how do we know if you are improving under our care? We use the latest technology available to determine how well your nervous system is functioning. The Insight Millineum uses two different tests to measure nerve function: 1) Surface Electromyography (SEMG) to detect the amount of electrical current in the muscles, and 2) Thermography to measure the skin temperature along the spine. Your muscles are controlled by nerves. The SEMG measures how well the motor nerves are working by reading the amount of current found in the muscles. Subluxations disturb the function of the nerve causing an abnormal amount of electrical current flowing to your muscles. The blood vessels are controlled by the same part of the Central Nervous System that runs your organs and glands, known as the Autonomc Nervous System. Your skin is the largest organ in the body and the blood vessels under the skin work as the body’s thermostat. If your body temperature is 98.6 degrees, then the left and right sides of your spine should also be the same temperature. When the communication between the nervous system and the blood vessels is disturbed by a subluxation, it causes the body’s thermostat to malfunction producing an imbalanced temperature reading along the spine. This thermography scan monitors how the Autonomic system is functioning. These scans are performed on yor first visit during your exam and periodically throughout your care as a method of measuring your progress. The scans can be performed on infants to adults. How would you rate your diet? Diets are not about losing weight. Our diet is what we eat, whether it be a diet of candy bars and ice cream or a vegetarian diet. Most of our patients admit that their diet is not that great. However, they all agree that if they improved their eating habits, they would be healthier. You do not have to be a vegetarian to eat right. Our goal for our patients is to make baby steps to improve their eating habits. Most people are surprised when we tell them to add things to their current diet instead of taking something away. For all of our patients, we recommend at least a good daily multivitamin and an omega 3 fatty acid supplement. 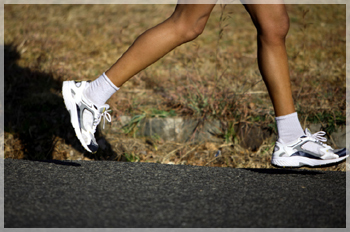 Most people do not realize the importance of foot health to their overall health. After gaining the understanding that the nerve system controls your body’s health and knowing that subluxations in the spine can cause the nerve system to lose function it is easy to see how foot problems that alter the way you walk can affect the movement of the spine. Therefore correcting foot problems can help the spine. Research has shown that if arch problems develop, one arch is affected more than the other in about 95% of cases. Therefore over-the-counter arch supports that give the same amount of correction to each foot may not address the problem completely. However, custom made orthotics, where each foot is measured individually, provide correction to the problems of each foot.